On the last Saturday before Christmas break, I introduced the belief of a forgiving God to my First Communion class. 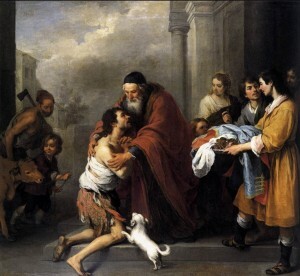 The lesson was based on a re-telling of The Prodigal Son. As usual, the class, the full complement of twenty-one this particular Saturday, participated eagerly in the discussion. The students had many questions: what if you keep doing the same sin over and over again – will God still forgive you; what if you break more than one of the Ten Commandments; can you break more than one of the Ten Commandments at a time; what if I do something, but I don’t really mean it, but I do it anyway? Their examples of mortal and venial sins were varied and showed an understanding of right and wrong. The class was very lively that morning, drawing answers and insights from the parable as well as real-life incidents from school and home. “Will Jesus force me to tell Him I’m sorry?” I asked. I sometimes wonder how many of the bright young children in my class will have the same enthusiasm for the Faith when they become adults. The Sacrament of Confession, it seems, is what we tend to discard first as we get older and then other teachings also fall away. Once we lose the humility to acknowledge our sinfulness, we start to lose our faith. What my Saturday morning class, and my own children when they were younger, demonstrate for me is Jesus’ admonition to become like a little child to enter into the Kingdom of God. See how enthusiastically the kids learn their lessons, how eager they are to express their opinion and how willing they are to do their catechism homework. When did we adults start losing that innocence and wonder? When did we begin moving further and further away from the crucifix and how do we get back? Our loss of innocence was gradual, almost imperceptible as we became immersed in the demands and cares of life. Most of us don’t even realize how far away from Jesus we really are. He stayed right where He always is, in our hearts, calling us to come back to Him but we started down our own self-destructive path in the opposite direction.